Former Texas Gov. Rick Perry, now the nominee for U.S. energy secretary, is moving to disentangle himself from potential conflicts of interest. Former Gov. Rick Perry, who saw a financial windfall in the private sector thanks in part to wealthy donors he cultivated while in state office, has begun to disentangle himself from assets and consulting relationships that could present a conflict of interest as U.S. energy secretary. In an ethics disclosure filed this week in Washington, Perry said he would sell off his holdings in several energy companies, including interests valued at $100,000 to $250,000 in Energy Transfer Partners, the Dallas-based company behind the controversial Dakota Access Pipeline. He also said he would unload similarly valued holdings in Dakota-related Sunoco Logistics Partners. Perry resigned from the boards of both companies, for which he was paid a combined $171,000 in board director fees in 2016, according to the report. In the letter about his disclosures, Perry, nominated by President-elect Donald Trump to take the helm of the U.S. Department of Energy, Perry described “the steps that I will take to avoid any actual or apparent conflict of interest in the event that I am confirmed" for the job. Energy Transfer Partners and Sunoco Logistics Partners are part of a network of pipeline companies controlled by Dallas billionaire Kelcy Warren, who over the years has given hundreds of thousands of dollars in campaign contributions to Perry and his successor, Gov. Greg Abbott. The latter named Warren to the Texas Parks and Wildlife Commission in late 2015. Pipeline protesters have since called on Warren to resign his state post. American Indians and environmentalists have fought the Dakota Access Pipeline's construction in North Dakota. The U.S. Army Corps of Engineers announced last month that it will look at alternate routes for a part of the project in the state. Perry’s holdings in Warren’s business empire are not the only financial relationships that tie Perry to former donors to his political endeavors. He also worked as a consultant to Holt Texas, known commercially as Holt Cat, the San Antonio-based company of Peter Holt, another top Perry donor. Perry didn’t report a specific amount for that consulting work this week, but in a previous federal report, released in 2015, he said he received income of $250,000 covering an 18-month period from Holt Texas. In the latest disclosure, Perry also reported receiving big fees from MCNA Insurance Company, the largest privately held dental insurance company in the country. The Florida-based insurer does business in Texas and was a major donor to Perry’s presidential campaign. Perry reported receiving $245,837 in “earned income” as a consultant for MCNA in 2016, the latest disclosure shows. 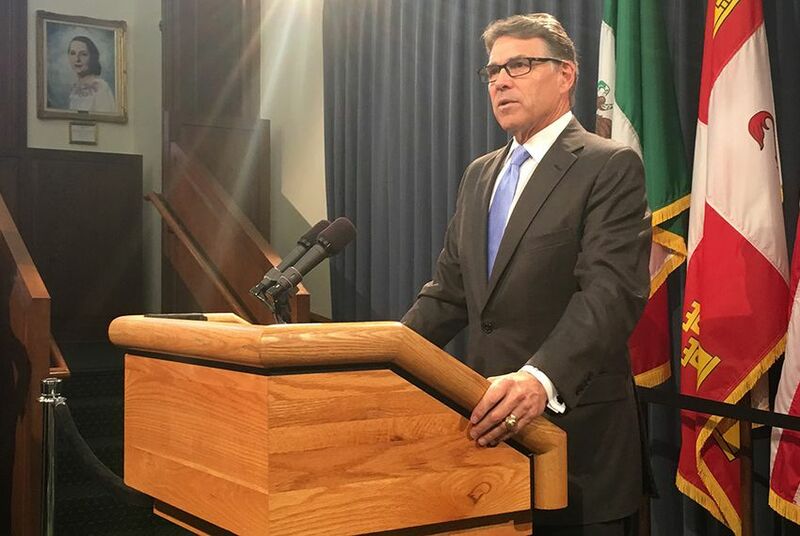 Perry also signaled that he would recuse himself as appropriate for certain periods of time from department actions related to some of the companies listed on the disclosure report, including the pipeline firms, unless he receives an official waiver. Elsewhere, Perry promised to divest himself of interests he holds in several other entities, including Tesla Motors, Microsoft, WPP Investments LP (connected to North Dakota oil leases) and Grey Rock Energy, related to a company co-founded by his son, Griffin Perry. Perry reported more than $1 million in income last year, an amount that includes more than $350,000 in fees from speaking engagements and about $600,000 in consulting income. The swagger-prone governor and presidential candidate, who famously double-dipped both his state salary and a government pension while still serving at the helm of state government, also reported receiving more than $100,000 ($8,940 per month) in gross state pension payments. On the liability side, Perry reported debts that could exceed $1.7 million, including a home mortgage valued at “over $1,000,000” and student loans of between $50,000 and $100,000. Following his appointment by President-elect Donald Trump to be the country's next energy secretary, former Gov. Rick Perry has resigned from the board of Dallas pipeline company Energy Transfer Partners. Key U.S. senators appeared more comfortable with former Texas Gov. Rick Perry being the next U.S. energy secretary than they were with former Exxon Mobil chief Rex Tillerson being the next U.S. secretary of state during recent visits. Disclosure: Tesla Motors has been a financial supporter of The Texas Tribune. A complete list of Tribune donors and sponsors can be viewed here.